After the French Acadians were expelled from the Annapolis Valley in 1755, the British sought to re-populate the rich farmlands. Colonists from the New England states were invited with the promise of free land. Mostly farmers and fishermen they were called Planters, planting the seeds of commerce in the New World. The Planters found abandoned apple orchards the Acadians had been using for hard cider production. Later they planted more apples, from varieties developed in New England, and set the stage for the Annapolis Valley to become a major apple production center. This BBQ sauce uses flavours common to New England and Atlantic Canada. Valley grown apples, pears and cherries sweetend with honey and maple syrup are smoked with a blend of orchard woods and spiced with our own grown peppers, mustard and corriander. Very fruit forward, with a touch of smokeiness, it's great on any grilled meats, especialy pork. Our Barbeque sauces are, really, a usage of many of the local ingredients and flavour profiles, and twists there-of, of our other sauces all blended into a unique grilling sauce. Plus a couple items we grew just for these sauces. 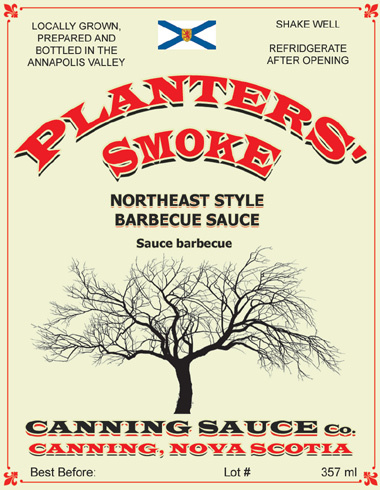 This culmination of our flavours reflects the timelines of the stories, about the Annapolis Valley, our other sauces tell, leading up to the era who's legacy we largely still exist within today - the Planters. Planter is the word the British used for colonists in the 1700's and 1800's. Look at old immigration records, church records of the local community, or census records during that period in many areas of North America, Australia, New Zealand, the Caribbean and other former colonies and you'll find many people listed as "planters" under the occupation column. This did not signify that they were farmers planting in the fields. It was the catch all term if you didn't have a well established and dignified occupation such as doctor, lawyer, merchant, etc. The British Empire was in the business of expanding it's empire and enriching the King. British subjects settling in new lands were the key to expanding British style commerce. The people, the colonists, were the crop being planted to grow the economies of these far flung lands and make the Kingdom of Great Britain richer and more powerful. Today many of the multi-generational farming families, and other family businesses, in the Annapolis Valley are the direct descendants of the Planters that arrived after the British pushed the French out. You see the family names everywhere in place names, street names, parks, buildings, rivers and lakes, etc, all over the Valley. Thankfully we're no longer expelling people at gunpoint, and many other groups of people from other places and cultures have since settled in the Valley, but the legacy of the Planters is still quite potent today. The history of farming in the Annapolis valley is a story of migration. First settled by Native Americans then later French Acadians in the 1600's, who were then displaced by New England Planters in the late 1700's. A wave of Dutch farmers arrived after WW2 bringing great innovation, as well as a sprinkling of farmers from cultures all over the world who've also made impacts here. Today, migrant farm workers from Mexico and the Carribean, working for the decendants of previous migrants, make major contributions to the labour and skill of producing vegetable and fruit crops here in Nova Scotia. 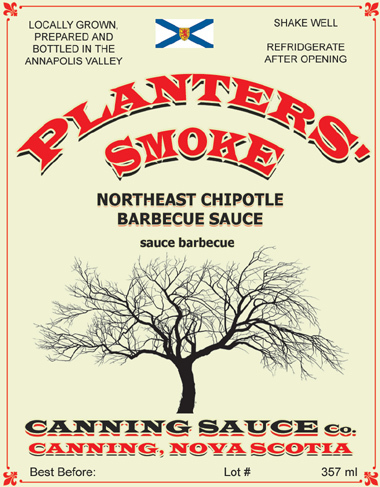 This BBQ sauce takes our regular Planters' Smoke sauce, using flavours common to New England and Atlantic Canada, and gives it some Mexican flare with the addition of Chipotle peppers. Valley grown ripe red jalapeno peppers are smoked with local fruit woods for a unique local version of this Mexican classic. Fruity and smokey with a bit of heat, it's great on any grilled meats, especialy chicken.